“My son and I just returned from an incredible experience at High Adventure Ranch and wanted to pass along our gratitude to everyone at the ranch. Making such a trip from New Orleans our expectations and hopes were very high and they were greatly exceeded!!! Shawn was our guide and he was very hard working and attentive to our needs. 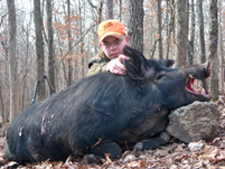 The Russian Boar that my son harvested was his first of any type of harvest and Shawn was very helpful throughout the entire process. We look forward to receiving the mount of that beauty with such a nice set of huge tusks. Mine was equally impressive with a back strap as big as my arm that we can’t wait to cook up Cajun style! Speaking of cooking, a big shout goes out to Rhonda who prepared some awesome meals. They were all great and in huge abundance, our favorites were the buffalo chili and the boar steaks. And the desserts…WOW! Funny, on the drive home there was some blurb on the radio about stressed spelled backwards is desserts. Our experience was stress-free and a good break from all the hectic times around the holidays, any residual stress was certainly relieved by those desserts!!! 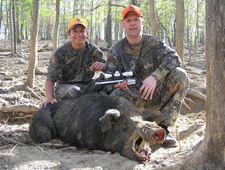 “My nephew (16 yrs old) and I made our first trip to HAR this past spring and hunted on May 2nd and 3rd. I purchased a package hunt for shooting a Russian Boar and a Corsican or Mouflon ram. 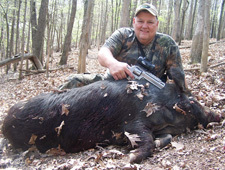 We lucked out and had perfect weather that weekend and I was able to shoot both animals on Friday using my S&W 460 mag. Revolver. The HAR is a perfect setting for using a handgun or bow. The quality of animals was excellent and our guide did a great job of getting us around to see a large number of animals. We were able to glass as long as we liked in order to find the animal(s) we wanted to hunt. As a bonus, my nephew was able to shoot a smaller ram on Saturday morning with his bow which was a thrill for him. His mount will look great next to a fine 11 point whitetail he killed in Iowa 2 years ago. 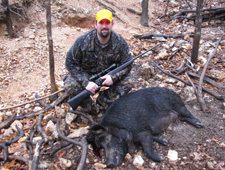 “Here are some photos taken during our recent hunt at High Adventure Ranch. 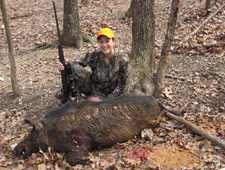 The first photo is my wife, Michelle, with a 300 pound Russian Boar taken on the first day of our hunt on March 27, 2009. 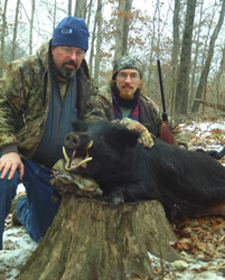 The second photo is me with a Russian Sow taken on March 28 as a second animal to fill the freezer.